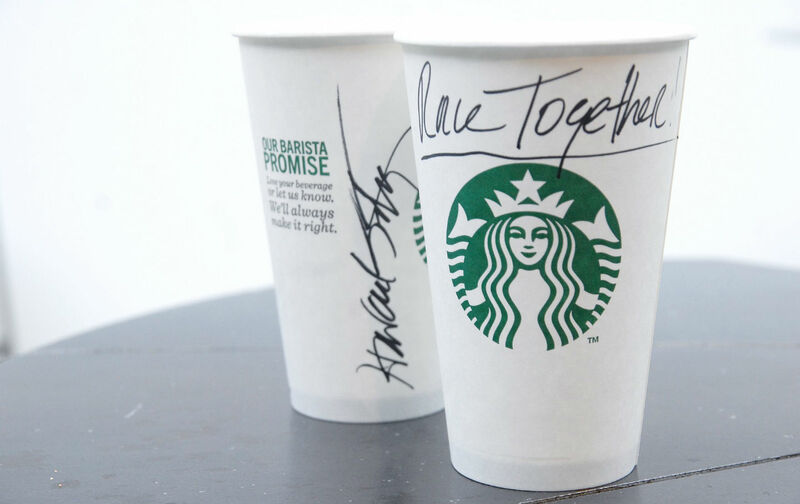 Writing “Race Together” on a coffee cup is not a solution to institutional racism—but it is a burden on an already underpaid workforce. McDonald’s has some unlikely company in at least one aspect of its labor practices: Starbucks. This week, Starbucks announced that it would encourage its baristas to write “Race Together” on coffee cups and engage customers in conversation about the state of race relations in the United States. The company is also giving its employees stickers and placing inserts in newspapers to get the conversations rolling. CEO Howard Schultz says the initiative comes out of his desire to show that “we at Starbucks should be willing to talk about these issues in America” after Michael Brown’s death in Ferguson, Missouri. It’s admirable that an executive is taking interest in social issues, rather than only fixating on protecting his own profits. But instead of doing something about it himself, Schultz is putting the onus on his workers—and asking them to go above the normal duties of a low-wage coffee house employee for no extra pay. In so doing, his company joins the likes of McDonald’s and several other low-wage employers. Today’s underpaid employees are increasingly asked to do more than show up for their shifts on time, perform their duties, and do so politely. Now many employers are also asking them for something more: putting on a performance along with serving up a burger or a Frappuccino. Ahead of Valentine’s Day, McDonald’s ran a campaign where employees were asked to randomly pick customers who could “pay with lovin” instead of money if they danced, called their mom or hugged someone nearby. In reality, that required McDonald’s employees, who make just above minimum wage, to put on a show of excitement and enthusiasm on top of work that can be so rushed and intense that it leads to physical harm. McDonald’s wasn’t the first employer to demand this kind of work from its employees. In 2013, Pret a Manger posted expectations of its workers: they should create a “sense of fun” and not act like they were “just here for the money.” (It later removed the requirements from its website.) It didn’t clarify what else an employee shows up for if not money. But more and more employers want their workers to pretend they get something out of work other than compensation. Some sociologists estimate that half of all jobs require emotional labor today, up from just a third in 1983. Starbucks’s campaign is slightly different. It’s not asking employees to show delight doing about menial tasks so customers get a better experience. But it’s still an emotional performance—demanded of employees who make less than $20,000 a year on average. Schultz may genuinely want to spark meaningful conversations about race relations, but the initiative means something for the Starbucks brand, too—and the low-paid employees serve as the uncompensated brand ambassadors. Many are also questioning whether these conversations can even do anything toward dismantling the deeply entrenched racism in our country’s systems and practices. In an open letter to the company, Race Forward executive director Rinku Sen notes that effective conversations about race have to be not about “what happens among individuals,” but “what happens as a result of systems.” But that takes a lot of, well, work. “A conversation that leads to something other than frustration requires preparation, a systems analysis, and potential solutions that reach beyond changing individual mindsets or behavior,” she writes. Schultz is a very wealthy man, reportedly making $21 million a year. If he wants to combat racism, he could do something himself: funding criminal justice reform efforts or groups working on voting rights or economic development projects. Those might be more effective than asking his employees to take on an extra task. Bryce CovertTwitterBryce Covert is a contributor at The Nation and a contributing op-ed writer at The New York Times.